Welcome to day TWO of the Go for the Gold class! I’ll be sharing some SUPER shiny techniques and products today….I think this might actually be the shiniest card I have ever made! 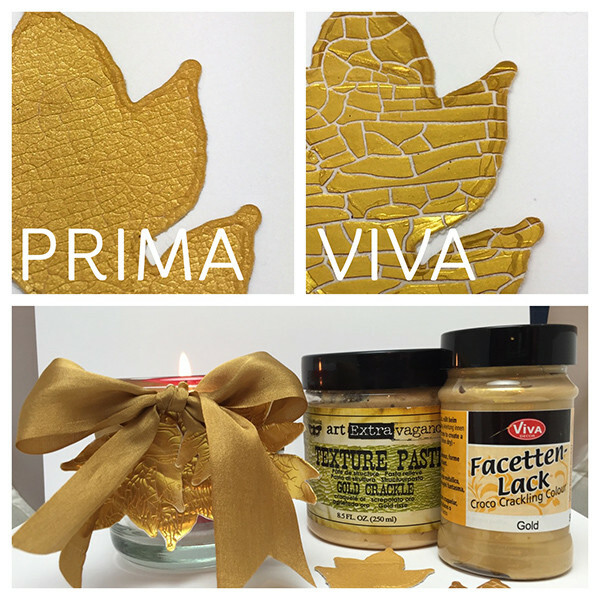 I’ve seen “Croco” called a number of things on the web….Facetten Lack, Crackle Paste, Crackle Paint – all as the same Viva product..I think they changed their packaging at some point, so it has lots of names. (There are other brands too, but I’m only looking at this one.) When I first used it, I didn’t have any of the Haft Grund – the base coat that’s supposed to go under it; it worked, but I wanted to see what the Haft Grund would do for it. It turned out to be a bigger difference than I expected! Watch the video below, or click HERE to see it in HD on YouTube. Then come on back here for more info! It made the piece flatter. When I tried it with both Craftaboard and regular cardstock, the one without the base coat curled pretty significantly. I’ll be using some of those curled leaves for a project on Periscope today, so be sure to tune in for that broadcast! It made the gold brighter. I’m not sure if it’s only because the crackle isn’t as deep, or if the crackle without the base coat sinks into the paper more. But it was definitely a different shade of gold. The card shown uses Delicata Golden Glitz ink with clear embossing powder on it; that’s one way to turn any pigment ink into an embossed look. That’s why I keep a lot of clear EP on hand! But I also tried out Wow Rich Gold and Stampendous Gold— and was surprised that the two looked almost identical. I thought Wow was going to be way better by all I’ve heard online about it! But the Stampendous is a slightly better value, per gram, so if you’ll use the slightly larger jar, it’s a good buy. Don’t forget to go make a card inspired by this class – you can enter one a day all week long to qualify for prizes! Link up over on the sticky post HERE. Thanks for another great video and another fabulous card. Thank you also for showing how to use the different products. I’ve never used the crackle type products because I didn’t really know what they would do. Now I know and maybe I’ll be adventurous enough to give them a try. Awesome crackle look. Can’t wait to sit down and watch all of these. Bought the viva products and am waiting on the base layer to dry so I can add the gold layer. Does it need to be completely dry? Thanks for the inspiration!! !